Search for the steamship General Slocum off Corson’s Inlet, New Jersey. September 12, 1994. I contracted with Ralph Wilbanks and Wes Hall to search for the General Slocum, the paddlewheel steamer that burned and sank in the Hudson River off New York on June 15, 1904, while carrying 1500 passengers on an weekend excursion. As high as 1200 hundred were reported dead, mostly women and children. After studying the reports on the sinking of the General Slocum, after she was raised and refitted into a barge called the Maryland, I decided highest probability area stemmed from the report of the Army Corp of Engineers who placed it a mile off shore abreast of Corson’s Inlet. Without going into a lengthy description of the research material and the results of the search, I have included all my data for the readers interest. The search, using sidescan sonar and proton magnetometer, turned up nothing that indicated the remains of the General Slocum/Maryland. Perhaps we might make another attempt someday, working further south toward Ludlam’s Beach. Contrary to the procedure of this book, although this barge sank under the name Maryland, I have listed it under the name for which it is notorious. So much has been written about the disaster at Hell Gate that I will give it only a short recounting. The General Slocum was an excursion steamer, reminiscent of lazy days on the Mississippi when side paddle wheelers were the most modern mode of river travel. The Hudson River was her route, and the morning of June 15, 1904, dawned like many others for the Slocum. 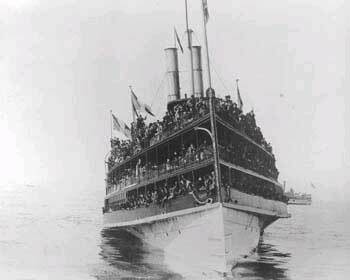 Nearly 1500 people crowded her three tiered decks; all but a hundred were women and children. The vessel was only a few hundred feet from shore when fire broke out and, fanned by the wind, quickly spread through the wooden superstructure. Captain William van Schaick found his craft dangerously close to the oil tanks on shore, and was forced to run full speed ahead toward North Brother Island. As the heat and flames became intolerable the crowd jammed up against the rails and broke through, depositing scores of women and children into the water. The Slocum ran aground on a rocky shore with a steep slope. A river tug came to the rescue and tied itself to the Slocum’s paddle box. The captain, some of the crew, and as many passengers as the cramped deck space could fit, got aboard before the tug itself caught fire and was forced to cast off. 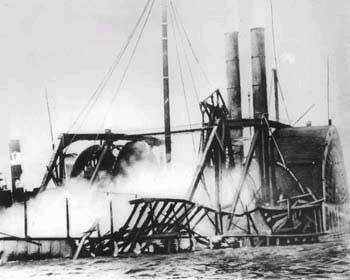 The Slocum’s upper deck collapsed, dropping people and burning timbers into the water. Fire boats steamed into the melee, and poured water on the raging conflagration. Then the hurricane deck disintegrated into fiery splinters. Hundreds oaf people were either burned to death, or were knocked into the water to drown. The ship eventually burned right to the waterline. Contemporary accounts hawked the death hall. at anywhere between 833 and 1,200, with something like 250 survivors. President Theodore Roosevelt ordered an investigation, which eventually returned a verdict of improper storage of flammable materials, rotted fire hose, old and substandard life preservers, insufficient crew training. Captain van Schaick was charged with manslaughter and criminal negligence, and sentenced to 10 years at hard labor in Sing Sing. The sentence was commuted after 2 years. The real culprit was determined to be the Slocum’s operators. According try the law, their liability was limited to the value of the vessel. The burned out hulk was raised and sold for $1,800. The General Slocum was sold to Peter Hagen, converted into a barge, and renamed Maryland. Laden with coke, and bound from Camden, NJ, to Newark, NJ, the old hull sprung a leak off Atlantic City. Captain Robert Moon, master of the tug Hudson, cast off the tow line after the Maryland slipped beneath the waves, and turned back to rescue the three men tending the barge. Despite high seas he got them all off. The wreck lay in shallow water, just off Ludlam Beach. By now it is probably sanded in, or torn apart by the surf. In September, 1994 Wes Hall of Mid Atlantic Technology and Ralph Wilbanks of Diversified Wilbanks, Inc. spent two days off Corson’s Inlet at the request of Clive Cussler and NUMA in an attempt to locate the wreck of the General Slocum. The initial thinking was that the wreck would be exposed on the bottom and a side scan sonar would be the best survey tool to locate it. Since then NUMA had located a document from the Annual Report of the Chief Engineers, 1912, page 1620, item 7. This small section of the document was a summation of the work done on the General Slocum wreck after it sank as the Maryland. It mentioned that the remains of the wreck were dynamited to lower the obstruction. The demolition began on February 12 and completed on February 18, 1912. This document would be important in the identification of the General Slocum, as it indicated that the wreck would not appear as a barge but would be broken up some. Local divers have stated that they have dived on the Maryland, but it now appears that if they were able to tell that their wreck was a barge, it probably was not the Maryland because of the 1912 demolition. In the summer of 2000, Dolan Research, Inc. of Philadelphia, PA conducted a survey of Corson’ s Inlet for the Corps of Engineers. They found two targets and gave me the coordinates. Armed with these new pieces of additional information, NUMA decided to again search for the General Slocum. In late September and October, 2000 another expedition was launched to locate the wreck. On December 11, 1911, the barge Maryland, loaded with coke sank off Corson’s Inlet, NJ. 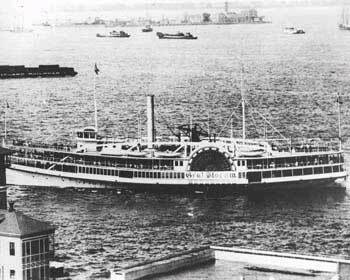 The Maryland was formerly the General Slocum, an excursion steamer. On June 15, 1904 while loaded with nearly 1000 ticket holders, mostly women (children needed no tickets) from the St. Mark’s Lutheran Church on East Sixth Street in New York on an annual outing, the General Slocum caught fire. Captain William Van Schaick turned the vessel into the wind and beached General Slocum in the East River. The death total varies but appears to be 1,028, mostly women and children. This was America’s second largest fire disaster. Our contour map indicated a site with the major magnetics area being 217 feet by 38 feet. Between September 26 and October 10, 2000 Shea McLean and Ralph Wilbanks were in Sea Isle City, NJ for NUMA’s second attempt to locate the General Slocum. Armed with additional research and the lighthouse location, a grid was established that began at the lighthouse and worked toward Corson’s Inlet. The survey area was from a half mile to one and a half miles off shore. The grids were expanded towards Corson’s Inlet as each survey block was finished. The research indicated that the wreck originally was in 24 feet of water, so the blocks went inside that depth. The expected characteristics for the General Slocum/Maryland target would be a water depth of about 24 feet, broken up magnetic signatures and enough of them to be iron pins from the original construction as a steamer, but not enough magnetics to be an engine or a boiler. Locating some coke fragments would be the clincher. Several small targets were located but none had the size or fit the criteria for the General Slocum. The survey was conducted on the RV Divercity, a 25-foot Parker. The survey tools were a 500 kHz side scan sonar, and a Geometrics 881 cesium magnetometer. The land spacing was 100 feet and they ran parallel to the beach. The site was then re-surveyed with the magnetometer using 30-foot lane spacing and contoured at 5 gamma and 2 gamma intervals. 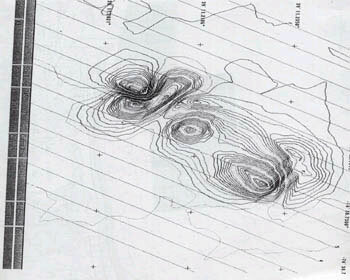 These contours allowed us to get very rough dimensions of the site. The Corps of Engineers in 1912 had reported the General Slocum to be 210 feet by 37 feet. Our contour map indicated a site with the major magnetics area being 217 feet by 38 feet. At this point we felt reasonably certain that this was the location of the General Slocum. To insure a thorough investigation, another small survey block closer to the beach near Corson’s Inlet was inspected and the two targets provided by Dolan Research, Inc. were surveyed with the magnetometer to determine their potential. Both were very far into the inlet, and one is a large magnetic target that is probably a steamer that sank in the 1860’s. (See Shipwrecks off the New Jersey Coast by Walter and Richard Krotee, 1965 at the Cape May County Library, Cape May Court House, NJ.) Gene Peterson of Atlantic Divers at Egg Harbor Township, NJ told us he had dived on a steamship in the Inlet. The other target was a single target and not spread out. It could be an anchor and chain from the other ship as it is the same general vicinity. It is probably not a shipwreck judging from the magnetic signature. This survey area is drawn in on the site map. Another target was obtained from Gene Peterson which he believed to be the Maryland (General Slocum). He gave us loran coordinates for this wreck site also. We checked its location relative to the new site believed to be the Maryland/General Slocum. It was 5.4 miles away from the new target near Corson’s Inlet, and in about 50 feet of water off Townson’s Inlet as opposed to the Corps’ indicated 25 feet of water off Corson’s Inlet. Given the contour size, the magnetics (not greater than 100 gammas and multi-component), the splintered fragments, the fragments of coke-like material, and the location (a mile from Corson’s Inlet and 3 miles from the Ludlum Beach Light) it is strongly probable that these are remains of the General Slocum. The fact that they are buried indicates it has not been dived on in the past. Several of the books we looked at, including Gary Gentlie’s Shipwrecks of New Jersey, all mention the General Slocum, but all fail to mention the Corps of Engineers work in 1912. This indicates that all were expecting the remains to be intact and look like a barge. 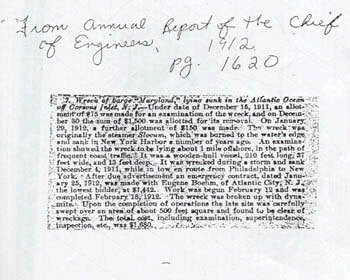 The Corps’ document indicated otherwise, and also indicated the wreck was located off Corson’s Inlet, NJ. Shea McLean and I arrived in Sea Isle City, NJ on September 26. Weather was generally cooperative and we established a grid based on previous research, and starting at the lighthouse we began work. Our survey area was from 0.5 miles to 1.5 miles from shore, and the grid was expanded toward Corson’ s Inlet as we finished each survey block. We were specifically looking for a “target” composed of several small targets, indicating a wreck that had been broken up with small magnetic signatures that could be iron pins from the original construction and not large enough to be a boiler or engine. We searched with both side scan and the magnetometer, running 100- foot lanes parallel to the beach. We found one target that seemed to fit our target criteria located in about 25 feet of water. Inspection determined that it was buried more than 3 feet under the sand. We dug for about three days, exposing large timbers, some splintered, and four fragments of something resembling coke. We switched to 30-foot land spacing with the magnetometer and contoured the area at 5 gamma and 2 gamma intervals. These contours gave us a rough dimension of the site of about 217 feet by 38 feet. This is the same as the 217 feet by 37 feet dimensions of The General Slocum indicated in a 1912 report by the Corps of Engineers. The magnetics also fit (not greater than 100 gammas and multi-components), as well as the nature of material recovered at the site. The location of this site, about a mile from Corson’ s Inlet and 3 miles from the Ludlurn Beach Light, corresponds with the Corps of Engineers indication that it is located off Corson’s Inlet. Gene Peterson of Atlantic Divers, a dive shop in Egg Harbor Township, said he dived the Maryland (General Slocum) and gave us the loran coordinates of the site. It was located 5.4 miles from our target in about 50 feet of water off Townson’s Inlet. Also, several of the books we looked at, including Gary Gentile’s Shipwrecks of New Jersey, all mentioned the General Slocum story, but failed to mention the 1912 Corps document. This could indicate that all were expecting the remains to be somewhat intact and look like a barge. The 1912 COE document states otherwise and that the wreck is off Corson’s Inlet. Since returning to Charleston I have had a gemologist and four professors from the College of Charleston Geology Department look at the best sample of the “coke” fragments, and all feel that it is indeed coke.